Several explosives have been sent in the mail to high-ranking Democrats and Trump critics since Monday, including former President Barack Obama and 2016 presidential candidate Hillary Clinton. Bomb squads are still investigating a bomb scare at the Sunrise, Florida, office of Rep. Debbie Wasserman Schultz, and a suspicious package intercepted before it could reach Rep. Maxine Waters. Multiple pipe bombs were sent in the mail to high-ranking Democrats and critics of President Donald Trump, including former President Barack Obama and former Secretary of State Hillary Clinton. The Secret Service on Wednesday said it intercepted two explosive devices addressed to the residences of Clinton and Obama. 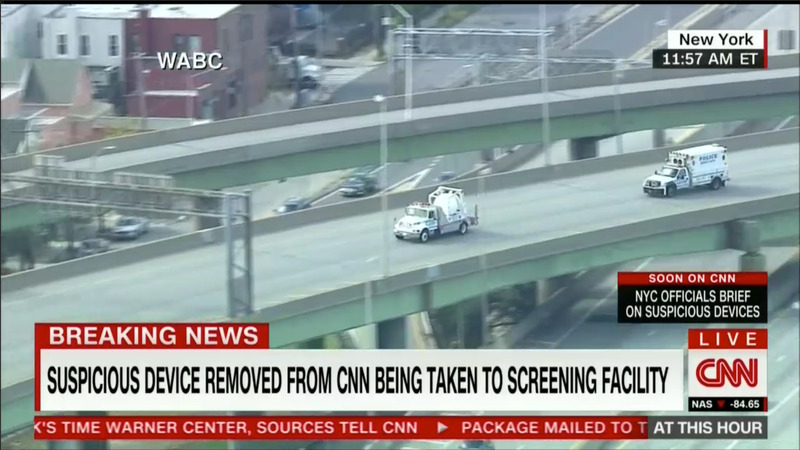 The situation escalated further when CNN evacuated its New York bureau when another explosive was found in the building’s mailroom. Several more incidents followed around the US, including at the offices of Democratic Rep. Debbie Wasserman Schultz, the former chair of the Democratic National Committee; California Democratic Rep. Maxine Waters; California Democratic Sen. Kamala Harris; and New York Gov. Andrew Cuomo. Early reports indicating a similar package was sent to the White House were later refuted by the Secret Service. “What we saw here today was an effort to terrorize. This clearly is an act of terror, attempting to undermine our free press and the leaders of this country through acts of violence,” New York City Mayor Bill de Blasio said. The multiple bomb scares come two days after a similar device was dropped off in the mailbox outside billionaire Democratic donor George Soros’ home in Katonah, New York. Katonah is less than 10 miles from Chappaqua, where Bill and Hillary Clinton have their main residence. Hillary was in Florida campaigning Wednesday, but her husband was home, according to a source who spoke with The Associated Press. A package addressed to Obama’s residence in Washington, DC, was intercepted early Wednesday morning. WABCThe NYPD bomb squad took the device found at the Time Warner Center to an off-site location to be detonated. The package discovered at CNN was dropped off mid-morning and was addressed to former CIA Director John Brennan, who is an analyst for MSNBC. NYPD Commissioner James O’Neill said at an afternoon press conference that an envelope with a white powder was also found with the CNN device and is being investigated as well. CNN reported that all the packages shared a common theme in that Schultz, the Democratic congresswoman, is listed as the sender. That appears to be why there was a bomb scare at Schultz’s Sunrise, Florida, offices Wednesday morning, when another package, addressed to former Attorney General Eric Holder, was returned to sender because of an incorrect address. Another suspicious package, intended for California Rep. Maxine Waters, was intercepted at a Congressional sorting facility in Maryland. California Sen. Kamala Harris’ San Diego offices were evacuated because of several suspicious packages, but they turned out to be safe. New York Gov. Andrew Cuomo said that he received a suspicious package at his Manhattan offices, but that was cleared as well. Two law-enforcement officials told The New York Times that the devices sent to Clinton and Obama were similar to one sent to Soros. At a Wednesday afternoon press conference, an FBI official said the devices discovered so far appear to be pipe bombs. The president has come under fire in recent days for encouraging attacks on the press. “We have to come together and send one very clear, strong, unmistakable message that acts or threats of political violence of any kind have no place in the United States of America,” he said. First lady Melania Trump also weighed in with a statement of her own. “We cannot tolerate those cowardly attacks and I strongly condemn all who choose violence,” Mrs. Trump said at the press conference. Following the discovery of the bomb at CNN, De Blasio issued a thinly veiled swipe at Trump. “To all public officials of all partisan affiliations: don’t encourage violence. Don’t encourage hatred. Don’t encourage attacks on the media. You can disagree but you have to show respect for people and air your disagreements peacefully,” he said. Wednesday afternoon, Hillary Clinton spoke at an event in Florida and addressed the mail bombs, while also saying how “grateful” she is every day for the protection of the Secret Service. “We are fine because of the men and women of the Secret Service who intercepted the package long before it made its way to our home,” she said. No one has claimed responsibility for any of the devices. 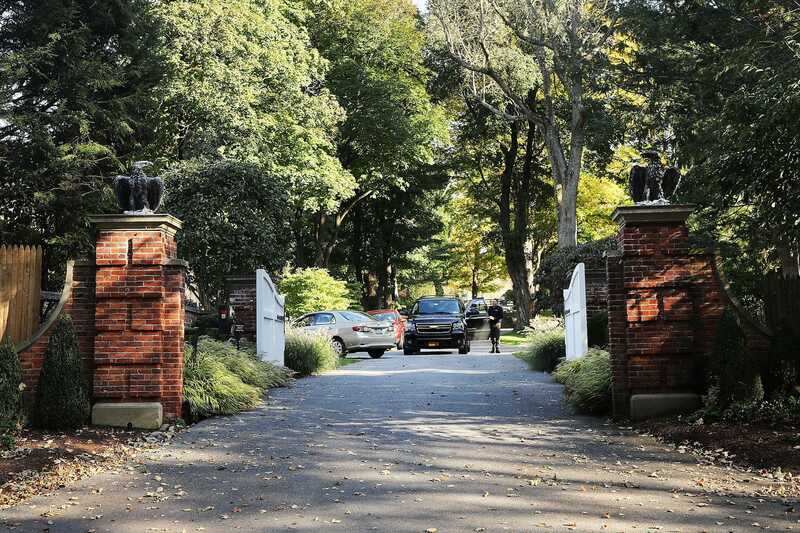 Spencer Platt/GettyA gate at the Bedford, New York, residence of the billionaire George Soros seen Tuesday.